Personal memoir coaching sessions are available in-person, over the phone or on Skype. Group classes and on-going workshops provide a dynamic guided process for discovery, development and productivity and it's at your pace. It's important to understand that you're journey is about remembering, writing-down, or audio recording, and in time sharing your story. It's easier than you would imagine. Your job is to remember, re-discover and grow. You're not your own judge, critic or editor. All of that just gets in the way. quality audio in your home, office or any space that provides comfort for you. Single sessions are recommended for those wanting to provide family, friends or a business audience with specific messaging. Topics may include family insights, relationship requests, ethical wills or simply expressions of love and gratitude. Others may have the need to pass forward succession plans, values, ethical insights, principles, life-experience and business wisdom. 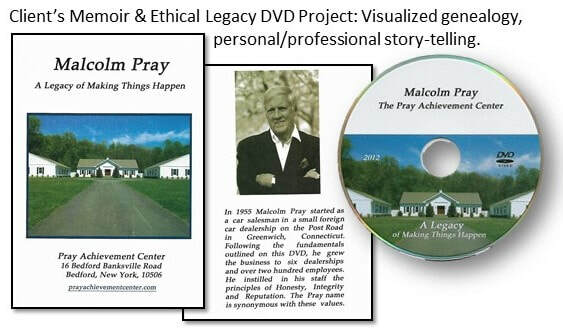 Video, whether on DVD or digital files, is provided with opening and ending titles. Additional message editing, added graphics or images is always available and does effect budget. Every videotaped guided-conversation session builds upon the previous. Each successive session opens new related and often connected memories and messaging, Organically, the puzzle pieces begin to connect broadening and rounding your story, all contributing to building an in-depth memoir. 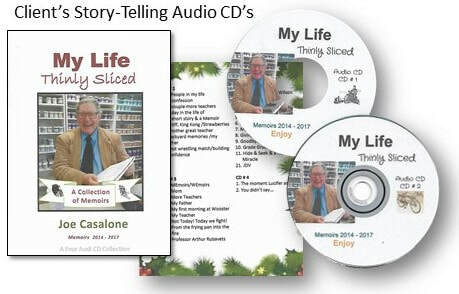 Audio - We transcribe audio from videotaped memoirs to produce memoir booklets and hard-cover books. Website - We create a dedicated (password-protected) website to host your digital video/audio memoirs, archival photography, family or business films and videos. This enables family, friends and associates direct access to all content.